Spring into Horror Read-a-Thon: Time to Sign Up!!! As scheduled almost a year ago, the Spring into Horror Read-a-Thon is almost here! It's coming to put some scare in your Spring on Monday, April 22 at 12:00am CST through Sunday, April 28 at 11:59pm CST (adjust times according to your time zone). Now don't let the word 'horror' scare you away. 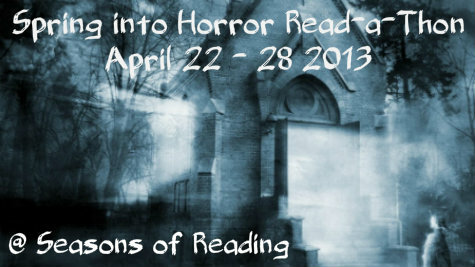 You only have to read one scary book during the duration of the read-a-thon. However, that book can be horror, paranormal, thriller, mystery, etc. The rest of the read-a-thon, you can read whatever you want. More horror/scary stuff or just your regular reading repertoire. As always, this is a week long read-a-thon, but you can join in and read whenever it's convenient for you. It's all about being laid back and getting some reading done...with a little bit of scary thrown in. You do not have to have a blog. You can sign up using your Goodreads, Twitter, or Facebook accounts. If you are planning on joining me (I hope so), please sign up in the linky below. You don't have to do a post now, but if you would like to help me spread the word, that would be great. (Don't forget that this is just the sign-up linky. There will be starting line sign-in and wrap-up linkies during the read-a-thon and doing both is required to be eligible for the giveaway). You can start any time during the week up until Friday night at midnight CST. Feel free to grab the button at the top of the post.